Abstract: Cancer is a cellular disease and is categorized as a disease that is caused by chromosomal inequity. The reverse inequity of the chromosomes and their displacement during cellular division are two main factors behind the production of cancerous cells. Introduction: for the past several decades news about cancer has been heard every day. Also, a new discovery and a modern scientific theory are discussed in scientific and nonscientific societies every day. It is a major problem that has brought the 21st century man having great technology to his knees. Thousands of scientists, specialists, experts, and even non-specialists across the globe are trying to unlock the secrets to overcome the fatal disease that kills a large No. of people and even other creatures on a daily basis. It seems the scientific communities gradually and temporarily set aside the cancer treatment projects and put forward the projects of life expectancy for most of the cancer patients. Nowadays, many seminars entitled “Living with Cancer” are held in Europe. All of them are the obvious signs of man‘s surrender to the big predicament. The whole world had pinned all its hopes on the Americans’ 1.5-billion-dollar cancer genome project over the past few years. But the latest news given by the head of the project has almost disappointed all. He said the changes in the genes of cancerous cells lack a meaningful pattern and most of the changes are made in chromosomes. By permission of God, I offer the fundamental principles of the cancer. Key point: The reverse inequity and the movement of chromosomes during cell division are the main cause of cancer in non-laboratory conditions. Other factors that are discussed as factors causing or controlling cancer are the subsidiary reasons that can only accelerate or decelerate the growth of cancer. The first fundamental principle is the creation of inverse inequity of chromosomes in the cells. Healthy cells have two groups of chromosomes that have two 23-strong pairs. One of the main features of natural living cells is the full bioelectric and bio electromagnetic balance of the paired chromosomes at the time of their rest. It means two sets of chromosomes must completely be equal in terms of bioelectric and bio electromagnetic volume and flow rate and completely opposite in terms of polarity. If the effects of internal and external destructive factors cause the reverse inequity (which was previously described), the paired categories of the chromosomes are in a mess. 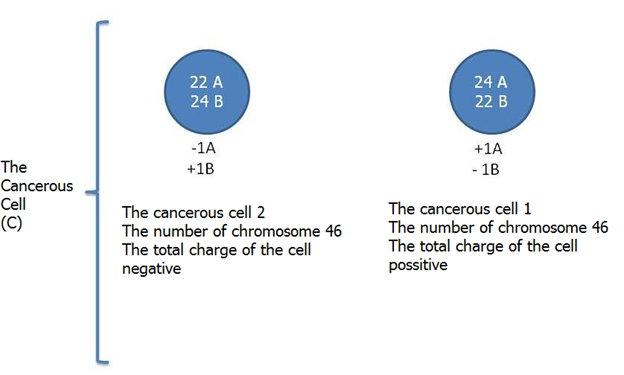 Usually 23 chromosomes should have positive charge and the other 23 chromosomes should have negative charge. If one of the chromosomes undergoes a whole change in its bio electromagnetic and bioelectric charge and becomes reverse, a cell with two sets of 22-strong chromosomes having opposite poles and two chromosomes with similar poles and charges will be produced. Similar bio electromagnetic charges repulse each other, causing the pressure inside the cell’s nucleus to sharply soar. The cells that try to survive reduce the pressure and quickly begin new divisions that lead to early maturity. The process firstly causes collective cellular suicide and secondly forms cancerous tumors. The second fundamental principle of chromosomal movement is related to the cell division process. For better understanding, firstly the condition of cell division should be exactly explained. When the order of the cell division is issued, the second samples of all chromosomes and other organs and micro-organs inside the cell will be made. After this phase ends, four sets of 23-strong chromosomes, including two general 46-chromosome sets with similar bio electromagnetic charges and poles will be produced. The management of bio electromagnetic charges of the cell is the responsibility of an organ that is called centriole. The second sample of centriole is made more quickly than chromosomes. In the final stage of their making, the pressure of bio electromagnetic charge of two similar categories of centrioles keeps them away and moves them toward the two sides of the dividing cell. After the centrioles are located at both sides of the dividing cell, they make bio electromagnetic contact with similar chromosomes’ connection point called centromere, determining the direction of division and movement of the chromosomes. In the last stage of cell division, all chromosomes will wind together like coil with full capacity. After complete winding, the bio electromagnetic field of the chromosomes will be at the highest possible level and the two similar 46-chromosome sets having the same polarity will repulse each other due to homonymous bio electromagnetic field and be driven away from the centromeres to centrioles on both sides of the cell. Thus, these two sets of the chromosomes separate and each of them will be placed in a new cell. It seems 46 tubes out of 54 tubes of every pair centrioles lead chromosomes and the remaining eight tubes steer the other organs and micro-organs of the cell. Centrioles have a fundamental role in cell division and their unique management prevents disorder in the main vital process of a cell. Therefore, two healthy cells with two 23-chromosome sets are produced. 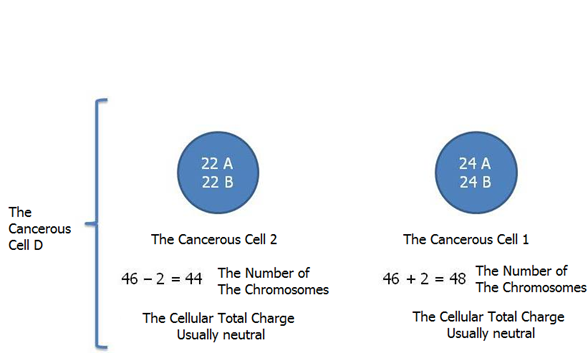 The main reason for having a cancerous cell is that if bio electromagnetic and electromagnetic fields have strong effects on separating chromosomes or centrioles and cause disorders in their polarities, the division of the chromosomes will not take place correctly and they will be distributed between the two divided cells in odd and irregular forms. The unequal set of chromosomes sharply increases the pressure inside the nucleus of the cell. As a result, the cell that intends to live reduces the pressure and is forced to divide at an earlier time. This causes the cells to commit suicide collectively in the first stage. If cells don’t die , In the next stage, cancerous tumors will form as a result of this process. The Set-A chromosomes of these cells divide correctly, but the Set-B chromosomes’ division faces errors. Thus, each divided cell of a female has unequal Set-B chromosomes. The cancerous cell No. 1 has one extra chromosome B, 47 chromosomes, and overall negative charge. The cancerous cell No. 2 lacks one chromosome B, has 45 chromosomes and overall positive charge. The important point is the different functions of the cells in a living being. The overall charges of living beings cause different functions of the cells. A male's overall charge is negative. So the cancerous cell No. 1 that has negative charge causes malignant tumors and the cancerous cell No. 2 that has positive charge commits suicide or is curbed by the defense system. So, it causes benign tumor. A female's overall charge is positive and the process is vice versa. In these cells, the division of Set-B chromosomes is done correctly, but the Set-A chromosomes’ division faces disorder. Thus, each divided cell of a female has unequal number of chromosome A. The cancerous cell No. 1 with an extra chromosome A has 47 chromosomes and its total charge is positive. The cancerous cell No. 2 lacking a chromosome B has 45 chromosomes and its total charge is negative. The cancerous cell No. 1 is malignant in males and causes malignant tumors. The cancerous cell No. 2 is benign and commits suicide or is controlled by the defense system. It causes benign tumors. The displacement is created in compound cancerous cells in both chromosome groups A and B. But the number of chromosomes of each female's cell is equal. 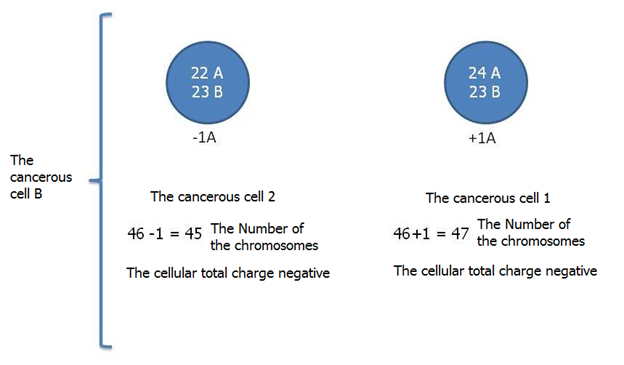 Thus, each divided cell has homonymous categories of the chromosomes A and B with equal charge and number. The cancerous cell No. 1 has one extra chromosome A and lacks one chromosome B. Totally it has 46 chromosomes and its overall cellular charge is positive. The cancerous cell No. 2 lacks one chromosome A and has one extra chromosome B. Totally it has 46 chromosomes and its overall cellular charge is negative. The cancerous cells No. 1 and No. 2 are malignant in both males and females in this section and produce malignant tumors. The cancerous cell No. 1 in females and No. 2 in males are more aggressive. In these cells, the division in both sets of chromosomes A and B suffers from disorder and the overall number of chromosomes in each cell is also unequal. Thus, each female cell has female chromosomes with unequal sets of chromosomes A and B. The total number of chromosomes in each cell is also unequal. The cancerous cell No. 1 has one extra chromosome A and one extra chromosome B and the cancerous cell No. 2 lacks one chromosome A and one chromosome B. 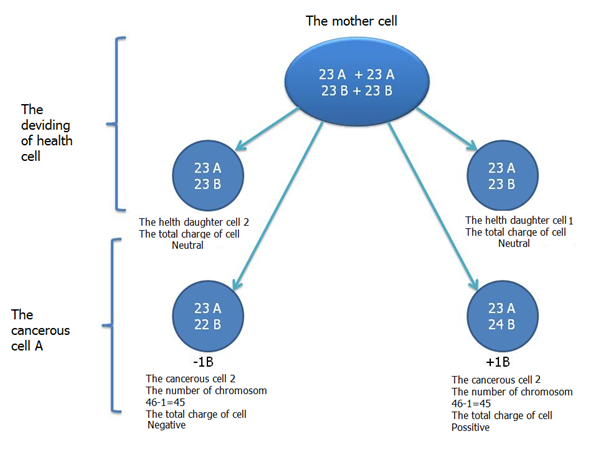 The overall charge of both cells is usually neutral. These cancerous cells are benign in both males and females and usually commit suicide or they are controlled by the defense system. Conclusion: The cancerous cells divide to reduce and distribute the unequal bio electromagnetic pressure inside of the cellular core and move it outside the cell. For this reason, it follows no pattern. Thus, a new cell is produced in each cellular division of cancerous cells. To say accurately, if there are 500 million divisions in a cancerous cell, there will be a cellular variety with nearly the same number. They are absolutely or relatively different from each other. On the other hand, cancer is a chromosomal disease and the wavelength of the chromosomes of every living being is unique. The unexpected result of the two subjects is that each person has unique cancer with millions of different cancerous cells. The variety of cancerous cells can be calculated by multiplying the number of cancer patients by the number of cancerous cells of a living being. The figures will be astronomical. That's why man has been so far incapable of treating the cancerous cells.